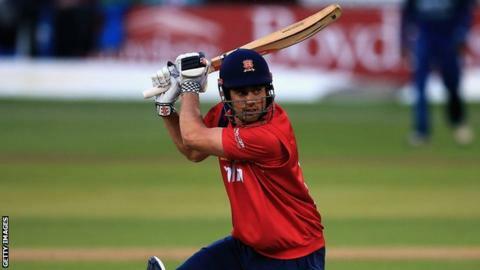 England captain Alastair Cook hit a half-century as Essex beat Sri Lanka by 22 runs via the Duckworth-Lewis method in a rain-affected match at Chelmsford. Cook scored 71 runs off 49 balls and Ben Foakes added 51, although another England batsman, Ravi Bopara, was out without scoring as Essex reached 161-5. Sri Lanka were set a revised target of 169 off 21 overs, but only made 146-9. On-loan Lancashire seamer Oliver Newby claimed 3-36 with two wickets apiece for Monty Panesar and Greg Smith. Wicketkeeper Dinesh Chandimal top scored for Sri Lanka with 31, but Kusal Perera (four), Mahela Jayawardene (six) and Lahiru Thirimanne (five) were all dismissed for single-figure scores. The tourists play two further one-day games - against Kent on 16 May and Sussex on 18 May - before meeting England in the only Twenty20 international at The Oval on 20 May. During their tour of England, Sri Lanka will also play five one-day internationals and two Test matches, the first of which begins on 12 June.